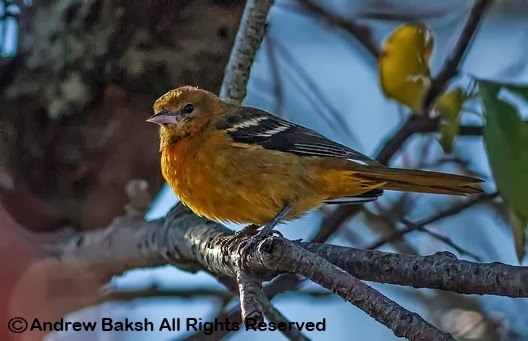 Baltimore Orioles (Icterus galbula) usually begin filtering into our region around the last week of April or 1st week of May. By mid September, most of them have departed, heading South. The latest dates seem to occur on Long Island especially with a few records noted at feeders in December going into January. However, late sightings seem to be expanding beyond Long Island (and please let's not get into the debate that Queens is part of LI). The latest date for this bird in Queens shows up in an eBird query, as November 24th. While this sighting, is not as late, an October bird still gets flagged as a late straggler. It is nice to have a photo to supplement one's description. 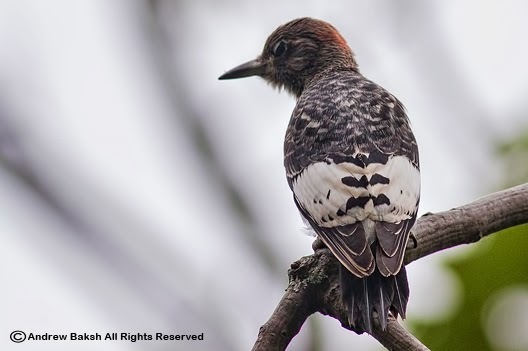 There could be two immature RED-HEADED WOODPECKERS at Kissena Park in Queens. 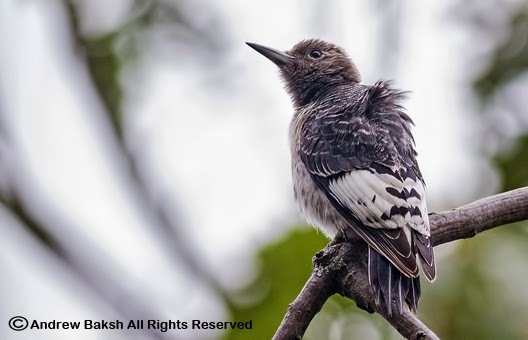 If not, then we have a bird that has traveled across the road to Kissena Corridor and back as I along with birder Joseph O'Sullivan have seen one at the Corridor on different occasions. This past Saturday Andria and I observed an immature RHWO near the lake - a bird that was reported earlier in the week by Eric Miller and presumed to be the same. I managed a few photos of this bird, so hopefully if I see and photograph the "supposedly" other RHWO across the street, I could determine if it is the same bird or not. 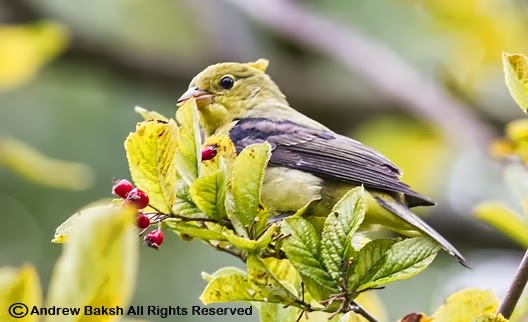 Other good birds at Kissena on Saturday included an ORANGE-CROWNED WARBLER seen at the Corridor (very likely the bird I found on Wednesday), Red-eyed Vireo, Brown Thrasher and a female Scarlet Tanager. While we await for the Sparrow build up at Kissena Park in Queens NY, birders continue to find interesting stuff there; especially, in an area known as "Kissena Corridor". 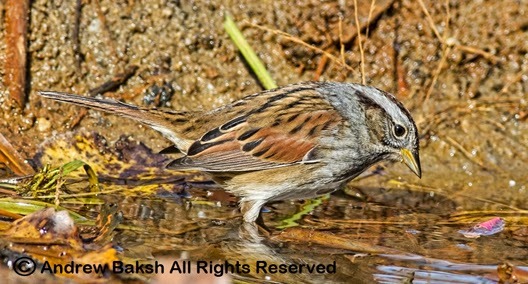 Birds like, Long Tailed Paradise Whydah, European Goldfinch, Budgerigar and just recently a Common Linnet was seen in the area. While these birds are all speculated to be "escapees" there are other "legitimate" birds to be seen. 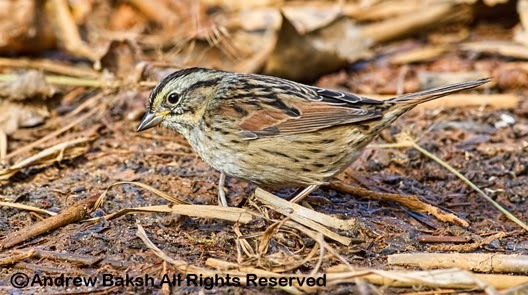 Good numbers of Indigo Buntings, Ruby-Crowned Kinglets and other more common birds have all been seen recently. 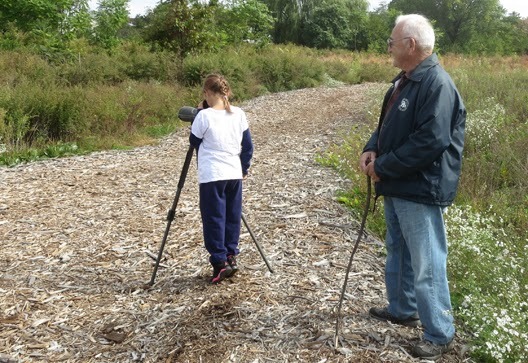 On Sunday, I found a 1st winter Blue Grosbeak, which was observed quite well with Andria as well as with grandfather Louie and his granddaughter (life bird for them). 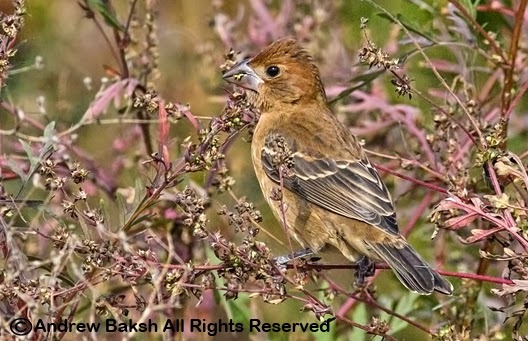 The bird was seen near the wood chip path on the right as you head towards the hospital and seemed to be favoring "Lambs Quarters" seeds from a plant near a huge patch of Mugwort. 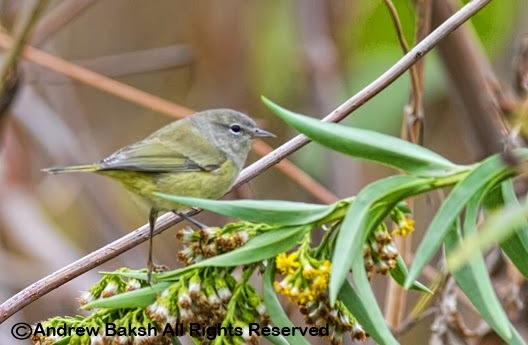 Today, near that same area I observed and photographed an Orange-Crowned Warbler. This bird was moving between that area and another weedy area that is on your left as you bear south on the wood chip path, as if you were heading towards the basketball courts. Other notable birds today included Scarlet Tanager and Field Sparrow. As we hit mid October, shorebirds continue to filter into the East Pond at Jamaica Bay Wildlife Refuge in Queens NY. Although numbers are in single digits for most species, the addition of a juvenile Hudsonian Godwit seen last week and a Buff-breasted Sandpiper seen yesterday, has increased the number of species of shorebirds this year on the East Pond. Especially, pleasing has been the opportunity to see some species of shorebirds in juvenile plumage and being able to study them at length. I will continue to post updates on shorebirds on the East Pond and will have a wrap up post with a comprehensive list of the species seen this year. I am hopeful that before the season comes to a close, I could add one or two more species. 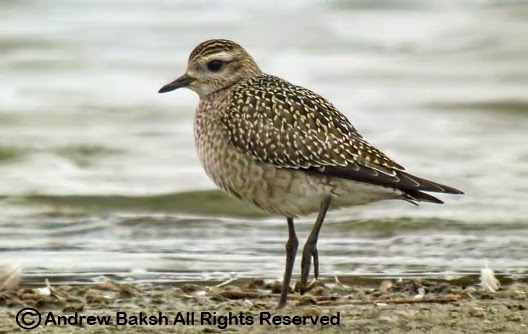 1st of two American Golden Plovers I found on the East Pond Recently. 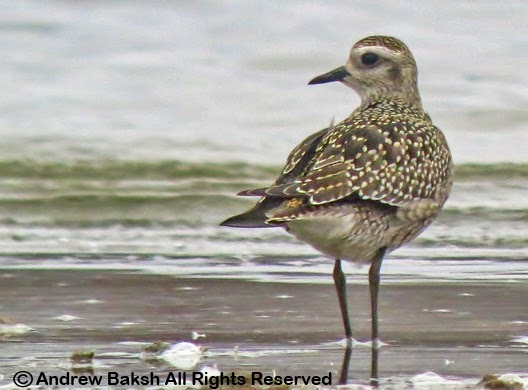 American Golden Plover on the East Pond at Jamaica Bay Wildlife Refuge. Last Sunday on a foggy day with precipitation I was out meandering around at Jones Beach on Long Island NY. Not a lot of birds around and it was the kind of day that one gets the urge to pack it in and call it a day early. My friends the Fuestels drove passed me as I walked along the median at West End II and jokingly asked if I shouldn't be watching a football game instead of lingering in the fog and wet. Grinning, I told them that I loved nothing better than birding in dreary weather. It was true, bad weather days are the ones that I enjoy being outdoors trying to unearth something of note. Continuing to bird West End, I walked into the median and had stopped to look at a moth I had kicked up, when out of the corner of my eye I picked up a bird flying low and into the shrubs. I tried to find it in the shrubs but could not. Not giving up, I continued to look, when suddenly a flycatcher type bird flew out of the other side of the shrubs with a Northern Mockingbird in pursuit. The chase was short and despite the poor lighting conditions I thought I saw a bit of yellow. The bird had again dropped out of sight and I patiently worked my way around to where I lost it. After searching for a bit I picked it up partially hidden in a shrub. 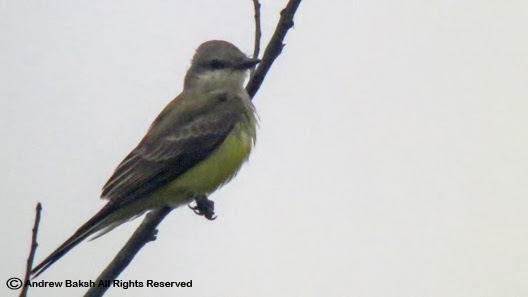 It looked wet and bedraggled but I thought it looked like it could be a Western Kingbird. I setup my scope and began to bear down on the area when the bird flew up and perched out in the open allowing good scope views. I was reaching for the phone as I lifted my head off the scope. 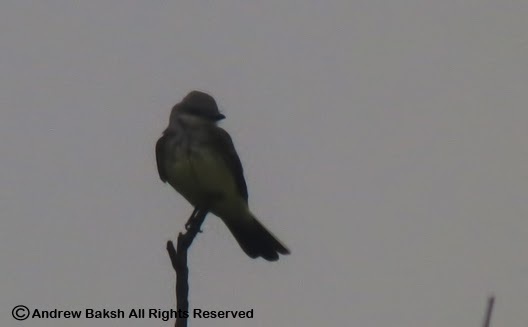 It was a Western Kingbird, confirmed by the white in the outer tail feathers which I had carefully looked over. I quickly called my friend Tom Burke who was still in Westchester with his party of three undecided on where next to bird. My phone call of the WEKI made that decision easy. I then jumped back onto the scope and grabbed a few digiscope shots, then called the Fuestels, Patricia Lindsay and Steve Walter. These were birders that were all in the area and I wanted them to know that I had just found a Western Kingbird. Next, I wrote up an e-mail and put out a post to the NY list serves. 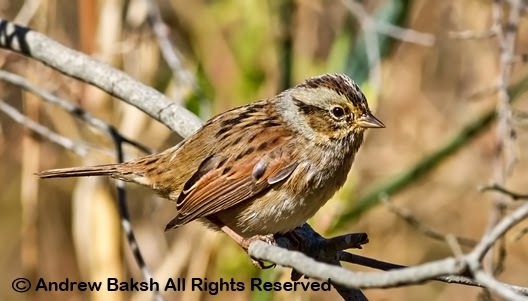 I did not realize this was a Nassau County first for me and coincidentally, my friend Bobby Berlingeri who successfully chased down the bird later in the afternoon called to thank me and in the process, informed me that it was a new Nassau County bird for him. New Nassau County bird for me too Bobby and I count my blessings for that! 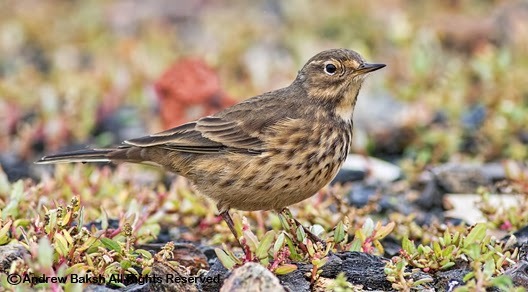 I think I will go with Buff-belied Pipit. 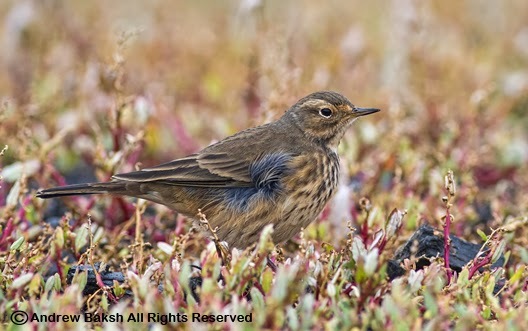 This is what the American Pipit, is known as in Europe and I think the name fits much better. I think, you will agree with me after looking at the following photos of the most buffy looking American Pipit that I have seen on the East Coast.